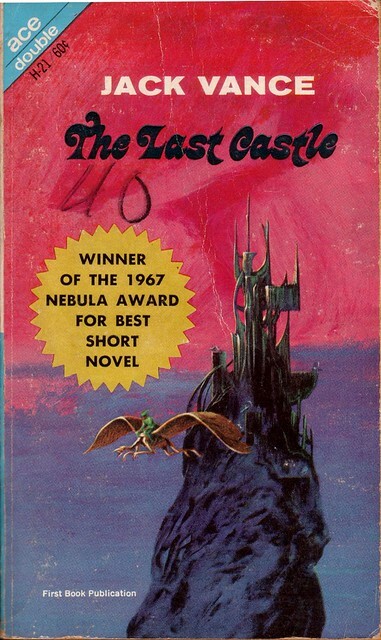 Continuing Jack Vance Week, The Last Castle, winner of Vance’s second Hugo Award and his first Nebula, both for short novel/novella. It appeared in Galaxy in 1966 before Ace acquired its first book rights, but despite regular appearances in collections it’s out of print again. As with Dragon Masters, Vance’s specialty was a unique blend of science-fantasy riddled with exotic locales, star-faring feudalisms, and rich alien cultures, something that a Hard SF purist might blanch at. But without those motifs we wouldn’t have Jack Vance, and he’s got a sizable fanbase for a reason: what he creates is unique, and Vance is good at what he does. Galaxy Science Fiction, April 1966 - Jack Gaughan. With a monopoly on Vance covers, Gaughan won the first of three successive Hugo the next year, after years of nominations. In the future, part of a super-cultured mankind has returned to Earth after exploring and colonizing distant galaxies; displacing the scattered humans still living on Earth, they build huge Castles as dwelling-places. They bring with them a menagerie of alien beings, modified to become servant races: Power-Wagons and irascible Birds for transport, slow and simple Peasants for daily labor, beautiful elfin Phanes to be viewed as works of art, and the Meks, a strange hive-minded race used to repair and operate mechanical devices. Now, after decades of service, the Meks revolt, slaughtering each Castle of humans one by one. We follow, off and on, a series of aristocratic gentleman within Hagedorn Castle, struggling to operate the machinery the Meks abandoned, much less come up with a plan for defense before they’re exterminated. Their detached arrogance is their major hindrance—using machinery or performing any kind of labor is unbecoming of a gentleman. Vance settles on Xanten for protagonist, a young aristocrat who’s sent out to determine the fate of their old spaceships, and to try and rally the original human inhabitants of Earth against the Meks. Meanwhile, the other Castles are sacked each in turn, save for Joneil and Hagedorn. Joneil faces its doomed fate in a powerful first chapter, leaving Hagedorn the titular last Castle. Ace Double H-21 - 1967 - Jack Gaughan again, a good choice to bring Vance's exotic baroqueness to book covers. Though this one's pretty empty. Compared to The Dragon Masters, the central concept is punchier and more developed; what a difference a few years makes. It’s easy to compare the humans in their Castles with genteel Southern antebellum plantation owners or European “white man’s burden” colonizers; for all their super-cultured culture and regimented social mores, the gentlemen aristocrats are flawed representations of humanity. They can make grandiose designs and theorems, but can’t handle the minutiae: day-to-day functions and operating simple equipment like radios is almost beyond them. It’s a product of their decision to “acquire” alien races and modify them as servitors: their equipment can’t function without the Meks. Their powerful technology—energy cannon and spaceships—is useless, lacking both maintenance and operating knowledge. It’s a complex situation when you’re figuring out who to root for. The protagonists are human, as opposed to the insectoid hive-mind Meks, and are being massacred without a direct reason, but their short-sightedness, prejudice, and arrogance is deplorable. It reflects well on Vance when his protagonist is a member of a flawed society who follows antiquated principles, yet is still sympathetic and heroic. In the end, the strongest members of the castle are those capable of adapting to their circumstance’s needs: the novel’s theme becomes turning aside from the traditional “how it’s always been done” to “survival at all costs.” Adaptation; indeed, a human theme. If you haven’t read a Vance novel—or read my last Vance post—you’re in for a treat. (I hope.) He has an inimitable writing style, and it fits his favored themes well. It has a sophisticated, baroque richness—I mean that in a good way, though it isn’t a hit with everybody—and it’s in strong form here, as is his ability to create exotic alien cultures. I only have two real complaints. First and most damning is that the resolution felt weak and unsatisfying: things that happen because that’s where the story needed to go, not because the characters developed that way. It’s implied that they did, but such development wasn’t shown, so it felt like deus ex machina. Second: for some reason Vance decided to integrate a lot of world-building into the text—cultural-societal and ancestry details—in the form of clinical footnotes or dry exposition. Which was very off-putting, since after a thrilling first chapter they dominated the story for several chapters. Vance builds a vibrant and unique world, and these details help develop it, but it felt distracting to jump out of the story’s immediacy into, say, the workings of personal name structures, or Castle Hagedorn’s social hierarchy. The scholarly notes were more extensive in the original, and editor Frederik Pohl cut them down by about half without asking Vance; as much as it must have pained Vance, I can’t imagine the story would have been improved by more distanced world-building. Ace Double 16641 - 1973 - artist unknown. Ace's covers in the '70s were awful; here, we have an alien Mek in front of some Olan Mills-type stock background. Some minor narrative flaws bring the book down, but they don’t ruin an excellent story. I think The Last Castle is a solid tale, worthy of its awards and acclaim. Vance combines his signature style with an intricate world and interesting concept, and it all works out very well. Piecemeal, the flaws are problematic—too slow after a great first chapter, too contrived at the end—but overall the novel follows an interesting arc, riddled with cool concepts and set in a breathtaking ornate world that only Vance could have designed. The story’s failings bugged me because they tarnished a fantastic little story. This is much closer to being Vance’s best, despite its contrived conclusion, with his prose and creativity firing on all cylinders. Tor Double #15 - 1989 - Brian Waugh. This is more like it: decadent, alien, and foreboding. 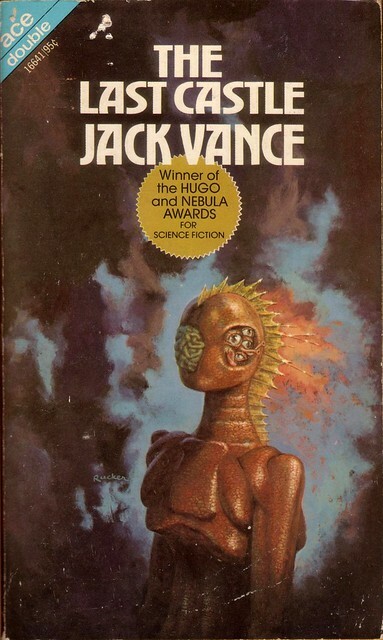 Thus ends Jack Vance week; alas, not an entire week of daily Jack Vance reviews—it’d take me a month to read enough Vance stories—but this isn’t the last we’ll see of Vance. I still have like a dozen of his novels to read. I suppose The Blue World is similar in this respect; ancient writings are re-examined and science and technology rediscovered. In all three books the protagonists all have to break out of old habits and thought processes and use what they have learned to save themselves or their community. I’ll have to look into those; I kinda like the theme. Sooner or later I’ll really plow through all the Vance I own and will need to pick up some more. Somewhere I have a copy of Lyonesse, and a copy of Araminta Station, a couple others… and I’ve been meaning to re-read all of the Dying Earth novels and see how they stand up to memory. The last cover is revolting. Wait, you liked it? The pink, the font, the fairytale-ish bridges, etc make is seem more along the romance lines — at least there aren’t any unicorns or princesses…. Yeah, it’s got that tacky romantic fantasy vibe going on, and that ’80s fascination with a silvered title (“Hey, hey, look, we figured out how to make metallic text!”), but it’s head and shoulders above the blah Ace covers I had to choose from. (I went with the Olan Mills alien portrait so I wouldn’t have to look at it.) The Galaxy cover does rock; Gaughan coming into his own. Cool! I keep on returning to that first cover…. the unusual floating/skeletal castle, the gun, the ridiculous angles = delightful. Found this post via Jack’s obituary in the New York TImes. I have to disagree about the lack of social commentary in Dragon Masters– the theme of humanity responding to the depredations of an alien invader which enslaves and genetically alters humans by enslaving and altering captured invaders is disquieting. How does one fight monsters without becoming a monster? Jack Vance doesn’t offer any answers, but his choice to portray protagonists who don’t necessarily occupy the moral high ground is social commentary enough. I’d also second the suggestion to read The Miracle Workers– it may be Jack’s finest work, it’s tighter than his usual prose, and his protagonist is a welcome change from the usual hyper-competent, self-assured SF hero. “fight back,” “leave the castle,” or “alliance”. The ending would work fine if I knew what she said and it was something that would never have occurred to him before.